I was young and poor when I heard this so I didn’t fully understand it, but I could tell it had the ring of truth. Over the years it’s an idea I have explored more thoroughly and with great results. Poverty is a huge concern in American society, and all over the world. Politicians, activists and social scientists spend countless hours on this topic, proposing solutions. Billions of tax and charitable dollars are spent and new laws and policies are made each year trying to rearrange society to combat it, yet millions of Americans remain poor. Just as there is a culture of poverty however, there is also a Culture of Wealth that can be observed, a manner of living and relating to the world that produces and maintains economic stability and abundance in the lives of its participants. There are many factors, beliefs, ideals, values, and behaviors that distinguish one culture from another. Oscar Lewis identified 70 markers that contribute to the culture of poverty, and the culture of wealth is directly inverse to them. But what is the primary factor by which anthropologists categorize and separate cultures from each other? The most significant factor that separates one cultural group from another is language. Similarly, subcultures within larger societies can be distinguished by their use of language, lingo, slang, jargon, vocabulary and professional terminology. Linguists Edward Sapir and Benjamin Lee Whorf suggested that language and its use may have a significant impact on an individual’s perception, cognition and their view of reality. This is known as the Sapir-Whorf Hypothesis. Numerous other linguists have suggested that features within language from vocabulary and grammar to phrases and metaphors influence if not dictate the structure of human thought. The manner in which we perceive and comprehend the world is heavily dependent on our understanding and use of language. This is also the theoretical foundation for the discipline of Neuro Linguistic Programming (NLP) which studies the effects language has on the subconscious mind and its influence on behavior. The metaphors a person uses give the key to their life and the way they think. A person to whom life is an adventure is going to approach events quite differently from a person for whom life is a struggle. Organizations use metaphors. An organization that prides itself on its team players is going to react differently from one that sees itself as a fighting force. One current metaphor for business is a ‘learning organization’, which conjures up a rather different picture. Strangely the financial world is sprinkled with liquid metaphors. They talk of cashflow, flooding the market, liquid and frozen assets, floating a company. Money is like water, perhaps? It’s well understood that in all fields of professionalism there is a lingo, a vocabulary, terminology that must be learned in order to function at even a novice level. If one aspires to be an engineer, a biologist, or a sailor he must learn the application of a particular vocabulary and vernacular. It should be no surprise to realize that economics, personal finance and simple successful household budgeting require a similar level of competency with its own vernacular, the language of commerce. This makes sense. Pick up any book about finance and you will run across terminology such as: investment objective, index fund, international equity and the language of commerce, of the Culture of Wealth is revealed. If an individual never has a clear understanding of terms such as positive and negative cash flow, disposable income, financial assets and liabilities, he will never think to apply them to daily life and therefore find difficulty accruing and maintaining wealth. Without the language to conceive of basic financial principles, the Culture of Poverty carries with it many other behavioral factors that keep people stuck in the lowest economic bracket. This behavior is characterized by apathy or hostility toward wealth and finances, a belief in the virtue of poverty, as well as irresponsible and extravagant spending patterns in order to project an appearance of wealth. This equates to financial self sabotage. Delayed gratification is a foreign concept to the culture of poverty. When the poor find a source of steady income they typically squander it through extravagant spending patterns on short term experiences and material things that quickly lose value. The financially secure however behave very differently. Thomas J. Stanley, Ph.D., author of The Millionaire Mind, a study of the lifestyle and habits of millionaires found that common behaviors of people whose net worth was $1 million or more included such habits as living below one’s means, entertaining family and friends at home rather than going to extravagant parties in the tradition of the beautiful people. Rather than spending their money on excessive consumables they chose to study and plan investments, attend religious services, and they avoided the use of credit and debt (Stanley 366). Dr. Stanley found that most millionaires have a well balanced life style without the flashiness of rock stars and Hollywood celebrities. They lead relatively normal lives, but spend a good portion of their time on activities directly related to their financial goals. Similarly, Rabbi Daniel Lapin has compiled a whole list of behaviors, beliefs, and attitudes that tend to lead Jewish people into successful positions and financial outcomes. In conclusion I’ll say again that poverty and wealth are cultural phenomena, and both of those cultures are in large part a result of language which determines a person’s perception of reality and therefore their behavior. Those individuals who escape the chains of poverty have learned to use and apply elements of the language of commerce while those who remain in poverty do not. Once an individual familiarizes himself with the vernacular of finance to the point that he feels comfortable working with and applying it on a daily basis, he begins to view things from a much more financially competent perspective. Naturally, this financially competent perspective influenced by a familiarity with economic language is a significantly motivating factor to financially responsible behavior. If more people of all ages were to become educated in this manner, though many individuals may still never become truly ‘wealthy’ those who put this education to use will come out of poverty and begin to establish executive control over many more aspects of their lives and their community. If you really want to start learning to be financially independent, start by picking up a book on financial terms. It will change your life. Florence Doisneau is a certified life coach, and the owner of Realize Unlimited, LLC. 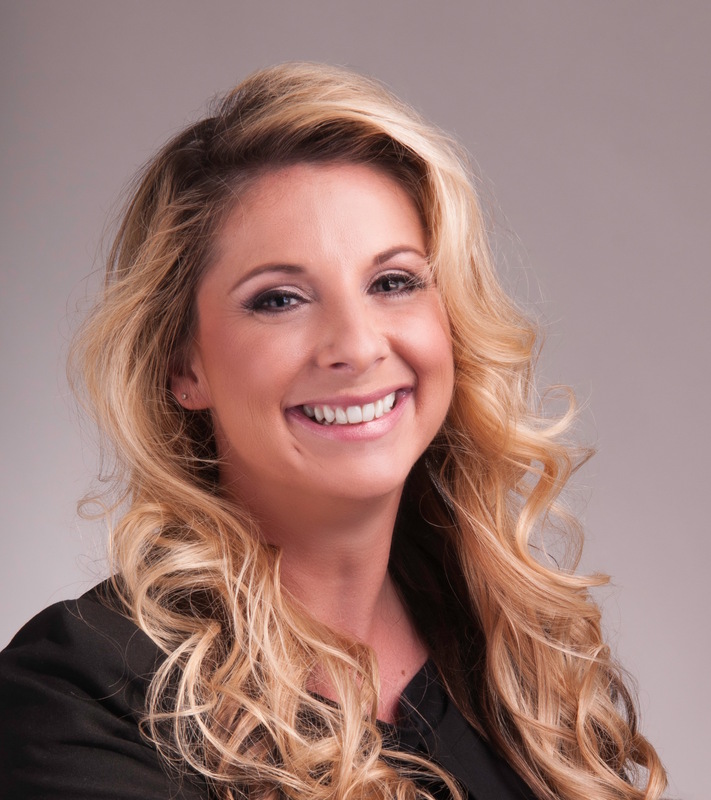 She assists clients in successfully defining and achieving their goals by supplying them with the tools and techniques they need to overcome the obstacles in their daily lives. Florence received her Life Coaching certification in 2014 from Coach U, and graduated from their Advanced Training Program in 2016. She is also a certified practitioner of Neuro-linguistic Programming (NLP) through the Tad James Company, a certified Yoga teacher, and she has her Masters Degree in Management and Bodyworks from Ecole Peyrefitte. She found her way to the vocation of Life Coaching through her own long and challenging journey during which she fought depression, anxiety, and social awkwardness in her own life. The tools she acquired along the way provided her with a much clearer perspective and a stronger resolve to create the fulfilling and joyous life she has always desired. This process inspired her to dedicate herself to helping other people overcome similar struggles. Florence hails from Bordeaux, France. After living and interning in various other countries including Japan, England, and Spain, in 2013 she made the United States her permanent home. She currently serves her community through a local health and wellness center wherein she coaches clients on improving their lives through modifications in lifestyle, as well as by coaching through her own organization, Realize Unlimited. For more information visit Realize Unlimited here! “Hear me four quarters of the world, I am a relative. Give me the power to walk the soft Earth, a relative to all that is. Give me eyes to see and the strength to understand that I may be like You. The Medicine Wheel symbol is a central spiritual and philosophical device used by many Native American communities. It consists of an equal-armed cross placed inside a circle. This is also a universal symbol that can be found throughout the nations of the world from the ancient days to today. It has been called by many names; the medicine wheel, sacred hoop, solar disk and sun circle, just to name a few. This symbol is central to Muskogee philosophy and is the basis for the layout of traditional ceremonial dance grounds. 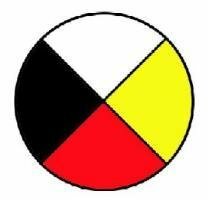 As a symbol, the Medicine Wheel is made up of two symbols; the circle and the compass cross. The circle is the most basic symbol for life and divinity. It is also the most perfect metaphor for God in geometry. The circle, like the Creator has no beginning and no end and therefore it represents eternity. Geometrically it is the essential symbol of balance and equality. And as the perfect symbol of the Creator, you could expect it to be apparent in creation. You have noticed that everything an Indian does is in a circle, and that is because the Power of the World always works in circles, and everything tries to be round. In the old days when we were a strong and happy people, all our power came to us from the sacred hoop of the nation, and so long as the hoop was unbroken, the people flourished. The flowering tree was the living center of our hoop, and the circle of the four quarters nourished it. The east gave peace and light, the south gave warmth, the west gave rain, and the north with its cold and mighty wind gave strength and endurance. This knowledge came to us from the outer world with our religion. Everything the Power of the World does is done in a circle. The sky is round, and I have heard that the earth is round like a ball, and so are the stars. The wind, in its greatest power, whirls. Birds make their nests in circles, for theirs is the same religion as ours. The sun comes forth and goes down again in a circle. The moon does the same, and both are round. Even the seasons form a great circle in their changing, and always come back again to where they were. The life of a man is a circle from childhood to childhood, and so it is in everything where power moves. Our tepees were always round like nests of birds, and those were always set in a circle, the nation’s hoop, a nest of many nests, where the Great Spirit meant for us to hatch our children. The circle represents a nest, and it is drawn by the toe because the eagle builds its nest with its claws. Although we are imitating the bird making its nest, there is another meaning to the action; we are thinking of Tirawa making the world for the people to live in. If you go on a high hill and look around, you will see the sky touching the earth on every side, and within this circular enclosure the people live. So the circles we have made are not only nests, but they also represent the circle Tirawa-atius has made for the dwelling place of all the people. The circles also stand for the kinship group, the clan, and the tribe. The sun which we depend on so directly in our lives has served as another great metaphor for the Creator throughout history. It is round and therefore the Medicine Wheel is also symbolic of this solar enlightenment. For this reason the medicine wheel symbol is often displayed within a solar motif with the rays of the sun extending outward in eight directions. With the sun circle and compass cross both being direct metaphors of the divine nature of the earth and the celestial respectively, the Medicine Wheel as a spiritual and philosophical tool is therefore an unparalleled tool for use in coming to knowledge of Nature and of Nature’s God. The cross is a four cornered compass. Each one of the four arms of the cross is attributed to a particular compass point, which is in turn associated to a particular philosophical or spiritual principle. In contemporary society the four directions tend to be taken for granted and with little regard. But to the elder ancestors they represented the very survival of the people. Our ancestors did not have the crutch of a GPS on which to rely. Instead they watched the sky, the path of the sun, moon, stars and even the shadows in order to keep track of the directions to avoid becoming lost or disoriented in the forest or on the prairie, something that could quickly result in death. In fact the very meaning of the word ‘disoriented’ is to be incapable of locating the east. Living in tune with the directions, the seasons and nature in general kept the elder ancestors alive, so naturally a system of philosophy developed about life and the hereafter as demonstrated through that symbolism. Each direction is thought of as a separate land, world or dimension, symbolically if not literally. Therefore each direction has its own natures, associations and inhabitants. In some ways each direction is thought of individually as separate Heavens and their inhabitants are spiritual beings like angels, ancestors and medicine powers. While the specific associations of each direction can vary greatly from people to people and from age to age, the following cardinal directions and their associations are based heavily off those that are most commonly encountered in native circles, with special emphasis placed on associations identifiable within Muscogee, Yuchi and Cherokee traditions. The east is associated with light and knowledge, because the sun comes up from the east and travels across the sky. 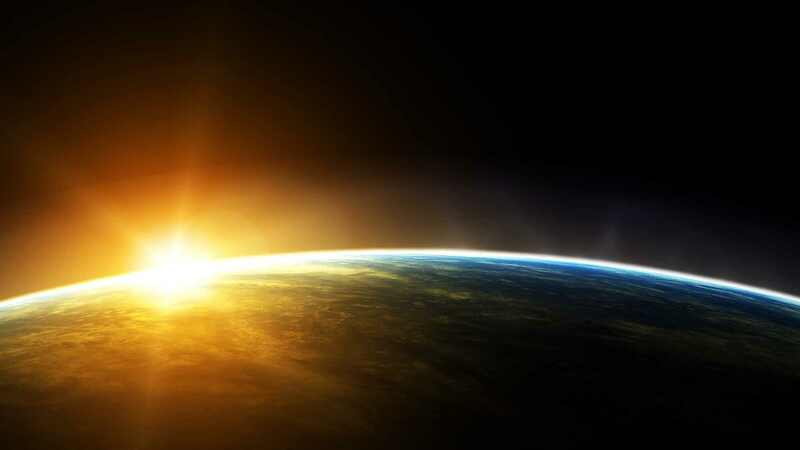 The sun is the source of life on earth and its light removes the cover of darkness, revealing what was previously hidden from view, therefore the east is associated with revelation, illumination and enlightenment. In Muskogee lore it is the Hawk which flies highest of all creatures. He is the messenger of the Creator, like an angel delivering prayers to Him and knowledge and revelation from Him. It is traditional in Muscogee as well as many other traditions to face east when praying. The north is the land of wisdom, the breath of life and inspiration. This is a land of elders, the source of ancestral wisdom and so the north is sometimes referred to as the “place of the white hairs.” It is associated with the buffalo and the deer who live closely to nature and know her ways intimately. The bald eagle is said to be stationed here, guarding the health and cleansing wind. In the Creek Migration Legend, the people took the red and yellow fire from the north and mixed it with fire from the sacred mountain and this is said to be the fire that Creeks use to this day, which sometimes sings. West is the place of darkness and introspection. The sun sets in the west and therefore this direction is associated with sleep and the subconscious. The spirits of departed are said to travel to the western world and so it is associated with death and the afterlife. The nature of the west’s earth association also connects it to the underworld caverns from whence tradition tells us the Muskogee people emerged. This is the womb of creation as well, and therefore represents life at its most primal state and incubation. The black bear is associated with this direction as is the panther. The bear’s penchant for residing in caves and sleeping through large portions of the winter make him a skilled adept of navigating the womb of creation and the world of dreams. Black Elk taught that the west is the home of the Thunderbird, which in Muscogee tradition is the Thunder being who brings the rains and lightning. The south is associated with warm purifying waters and virtue. These waters are specifically the deep bodies of water aside from the storm and rains. For the most obvious reasons water is the element of cleansing. Not only is it essential in daily hygiene but it is also vital in the human body’s natural process of purification and detoxification. Water also represents change over time by the process of erosion which reshapes old landscapes and renews the earth. Water is also intricately connected with the underworld. Muskogee tradition tells us that the Great Snake guards the southern waters. Together, the sacred circle and the compass cross portray the divine in both the ethereal and the physical sense. It is important to understand that these are considered to be integrated and whole, not separate perceptions. Each person must come to fully understand and integrate the teachings of each direction, one by one until they have traversed the entire compass in order to attain a life of wisdom and fulfillment. All together it teaches us balance and provides us with the tools to build a healthy spiritual life. The integration of these attributes and principles into a person’s spirit is achieved by diligent efforts in meditation, contemplation and daily application of these principles. When we consider our relationship on the medicine wheel, we truly consider our circumstances; literally where we stand inside the circle. These efforts can be heightened by living close to the earth and taking part in our native traditions. This Medicine Wheel philosophy is a root philosophy which has influenced the lives of native people for centuries. It is practical, logical and metaphorical. It connects us to our time and place, instills our perception of the world with wonder and provides us with a basis by which we can contemplate our own nature and that of all creation. Dave Ramsey is a financial guru for the average person. Even if you think you’re doing alright with your money, Dave can help you see the folly of your ways that prevents you from truly excelling financially. When I finally made the decision to focus on my finance and figure out the secret to creating wealth I explored numerous books, and audio programs by many different financial gurus. I read Robert Kiyosaki, Donald Trump, Brian Tracy, and even Gene Simmons, just to name a few. I began perusing business magazines, and I learned a lot by doing this. The problem with most of these books and programs was that although they taught me a lot, most of them are written under the assumption that the reader already has a certain amount of capital at hand, ready to invest. But I was broke, getting by paycheck to paycheck. Sure, I knew saving was a good idea, but I was in debt, and any time I tried to save, some sort of emergency or an overdue bill sucked out that cash and it was gone. It began to feel futile. I knew I should invest, but I was clueless where to start from my financial position, from broke. So one day, like a similar day years earlier, distraught with financial indignity, I made my way to the local book store to look for that bit of wisdom that I knew I had somehow overlooked. There, I came to a full sized advertisement for Dave Ramsey and his radio show, syndicated on a local station. So I browsed a couple of his books on the shelf. The advice between those covers was invaluable. What was best is that it applied to me, not just to someone with 30 grand waiting to be invested. Being broke, I couldn’t afford to buy one of those books right then. Sorry Dave, but you told me not to spend money I didn’t have. I went out to my car and tuned into your show instead. It was one of the best decisions I’d made in years. I quickly became a regular listener. Dave Ramsey has it down to a science. What’s more, he doesn’t assume you have any money to start with. In fact, his lessons begin (dare I say) with the assumption that you are broke, in debt, and completely clueless about money. It’s not that he talks down to you, as much as it is he wants you to clearly understand just how foolish the average person is about money, credit, and debt. He doesn’t try to sell you on a get-rich-quick scheme. In fact, he nearly condemns such ideas. The best thing is that Dave Ramsey told me were I should start and in what order I should do things to get out of debt and to prosper. After listening to Dave on the radio for several weeks, Christmas was just around the corner. 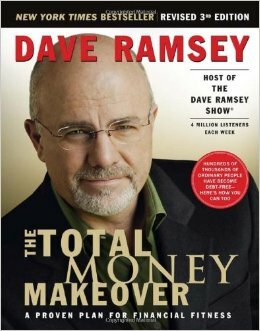 At the top of my list was Dave Ramsey Total Money Makeover. I opted for the audiobook version, because as I graduate student I don’t have a lot of time for leisure reading, but I can’t read my assigned materials while driving or working. I later took advantage of a Veteran’s Day giveaway and enrolled in his online Financial Peace University. By following Dave’s advice and applying his baby-steps, I have seen my finances improve amazingly. On top of that, I have much more peace of mind than I did just a year before. Dave’s first baby-step is to save $1000 as quickly as possible (or $500 if you make less than $20,000 a year). This is the emergency fund to be used only in a genuine emergency while you begin working the next six steps. About six months into the program I had just such an emergency. An auto emergency was going to cost me nearly $300. At first I was angry. This was all I needed. I immediately went into my poverty mindset thinking about how much inconvenience this was causing me in my life. Then I remembered my emergency fund. This sort of thing is exactly what it was there for! A little smile came across my face, and I actually felt good. Of course nobody feels good about having to shell out hundreds for unexpected auto repairs, but for the first time in my life I was actually financially prepared. I managed to pay it all off with one swift payment and drive out of the shop beaming with satisfaction. And that felt great! It was all just a bump in the road. A year earlier, I would have been in a real pickle. I would have had to beg, and borrow. It might have taken weeks, or even months to get the finances together for the repairs, and it might have impacted my ability to pay my bills. This time however, it didn’t even affect my fun money. I could still go out to the pub that weekend for some good old Irish music, and within two months my emergency fund was topped off once again. For anyone who is serious about getting their finances together, unlearning all their poverty inducing bad habits, and replacing them with wise wealth creating behavior, I cannot recommend Dave Ramsey more. He has helped me replace my naive hope for wealth with a practical and realistic plan for creating it. Dave can’t help everyone, however. The path to financial peace is not easy. It does take discipline and perseverance. You have to be ready, emotionally, psychologically, and spiritually to change your behavior, and to do the necessary work it takes to achieve it. The hardest part for many people is that you must be ready to take personal responsibility for your own financial situation. If you really want to break the bonds of financial servitude and make your way toward wealth visit Dave Ramsey’s website now. Find him on your local radio station. You will be happy you did! First you have to realize that you already are in business. YOU are your business. Your life and your body is your corporation. 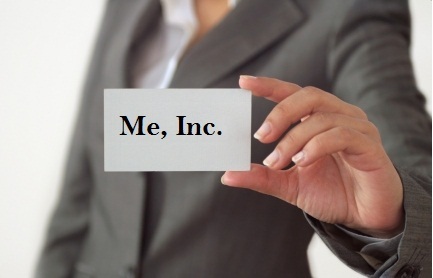 As Dave Ramsey says; “You are the CEO of Me Incorporated.” As soon as you realize that whether you have a business license of not, whether you are technically an employee in a business owned by someone else or not, you are in fact self-employed. If you get your paycheck from a single source you are in fact a corporation with a single client. Even fortune five-hundred company owners have employers. We call them customers, clients, or investors but they are in fact the employers who provide the revenue for the business and pay the salaries of the owners, management, and employees of the company. As an employee, your employer is the investor in or financier of your business, even if your business is operating a broom at the local McDonald’s. There is a sort of magic to your thoughts. If you see yourself as just an employee, a worker rather than a businessperson, you are likely to fall into the complacency of wage slavery. Here you wind up working just for the money, often a lesser amount than you are capable of earning. When you realize that your life is a business you become empowered by seeing yourself as a business owner: the CEO of You Inc. Jobs become streams or revenue, money becomes cashflow and capital. You will be compelled to learn more about business, and as your knowledge of the subject increases you will become more prepared to consider operating your own corporation. A major factor important to anyone’s success is mindset and perspective. So adopt the mindset that you are already self-employed. You are already a business owner, whether that business is doing well or doing poorly. The same principles used by a successful corporation can be applied to your own life. This works whether you are married or single, have children or are childless. The only difference is the number of ‘shareholders’ to whom you may have a fiduciary responsibility. The Law of Attraction is a metaphysical theory asserting that “like attracts like,” or those things that a person thinks about the most are those that will naturally be attracted to him. Though recently popularized again by the 2006 book and film The Secret by Rhonda Byrne the term “Law of Attraction” was originally coined by New Thought Movement guru William Walker Atkinson in his 1906 book Thought Vibration or the Law of Attraction in the Thought World. Simply stated the Law of Attraction is established upon the premise that thinking positive thoughts naturally attracts positive affects and negative thoughts just as naturally affect one negatively. If a person can form a clear and strong image of one’s desire in their mind and recreate it consistently, the acquisition of the desired object or goal will be realized. Likewise if one obsesses over negative thoughts and fears, those things will become manifest in his life. We become what we think about most of the time. The key to activating the Law of Attraction in your life begins with simple visualization exercises. Decide what you want, perhaps a better job, a pay raise or a new lover. Sit down in a comfortable position and imagine yourself having this thing. Make it as real in your mind as possible. Feel the sensations you would have if you had this thing you desire. If it is a new car, imagine the sensations of driving it, the new car smell and the way the sun gleams off the chrome. Make this an enjoyable event, conjuring up all the positive feelings you can create and firmly attach them to all the sensations related to your desired outcome. To avoid sabotaging yourself in this activity you must be sure to carefully monitor your words and thoughts. Whenever we speak or think we effectively affirm certain beliefs in our minds. Every time we say or think something like “I’ll never have that much money,” or some other limiting belief, we undermine our efforts. You must maintain a constant certainty that your desired outcome is already yours and working its way to you at this very moment. There are two main theories explaining how the Law of Attraction works. The more metaphysical explanation is expressed in the book The Secret; that the thoughts we think are broadcast to the universe as if we were making an order from a catalog. If we are thinking about and envisioning our success then the universe will deliver success. If however, we are constantly fretting over our fears, those are what will be delivered. A more pragmatic explanation for the Law of Attraction is that by practicing visualization techniques and by monitoring our thoughts we condition our subconscious minds to expect those things we think about most. Since the subconscious mind cannot process a negative, then thinking about the things we don’t want is effectively the same as if we wanted them to come true. By conditioning our subconscious minds to expect success, achievement or even failure, we become motivated to act and behave in ways that will bring that into reality. Either way one sees the process unfold, the core lesson to be learned from the Law of Attraction is that we are responsible for our own lives and conditions based off our own thoughts and conditioning. This is more than just “positive thinking” or simple recitation of affirmations encountered in the typical self help seminar. The Law of Attraction requires consistent maintenance of positive belief and deep visualization in order for it to be effective. Love, wealth and happiness are ours for the taking if only we can visualize ourselves having them, not at some future point, but right now regardless of our current predicaments. Lapin, Rabbi Daniel (2010) Thou Shall Prosper: Ten Commandments for Making Money, Second Edition, Hoboken, John Wiley and Sons Inc.
Thou Shall Prosper is a fascinating exploration into wealth creation among Jews and the values within Jewish communities that encourage financial success. It is organized into 10 separate chapters, titled commandments in imitation of the Laws given to Moses. Written by Daniel Lapin, an Orthodox Jewish Rabbi motivated by a desire to research and catalog the cultural traits that have contributed to this, making them available to all people. The book promotes what Rabbi Lapin calls Ethical Capitalism. I have always been fascinated by the subject of Jewish success. It only takes a little attention to notice that Jews are disproportionately successful in business and finance than any other ethnic group in the United States, if not the world. As Rabbi Lapin explains, this is not to suggest that there are no poor Jews. But as the most consistently oppressed people throughout 3,000 years of history, the Jewish people could easily have been expected to cease existing altogether. But they haven’t, and wherever Jews are afforded the slightest opportunity they tend to thrive. Rabbi Lapin points out that Jews represent less than 2% of the American population, but in any given year may represent as much as 25% of the names on the Forbes 400 list of wealthiest Americans. Jewish households are also twice as likely to be wealthy as those of non-Jews. This is a remarkable phenomenon that deserves to be explored and hopefully explained. Anti-Semitic conspiracy enthusiasts might see all this as evidence of Jewish misdeed in acquiring wealth. * However, genuine social scientists understand that a better explanation lays in some set of cultural values being perpetuated within Jewish communities. Personally, I have always seen this as admirable, like a mystery to be unraveled. That’s why, when I found this book on the shelf, I didn’t have to think very long before I happily handed the clerk $24.95 (plus tax) and walked out the door with the book under my arm, ready to read. Foreseeing the anti-Semitic arguments, early in the introduction Rabbi Lapin debunks the idea of Jews operating jointly as some sort of cabal, plotting their dominance over society. In fact, Rabbi Lapin explains that Jewish communities are typically just as dysfunctional and full of conflict as most others. Rabbi Lapin makes many points along the way regarding wealth, Jews, and the world, all of which are worth some serious consideration. Lapin illustrates early on that education is very important to being successful in business and finance. Jews, though not necessarily any “smarter” naturally than non-Jews tend to place a lot of value on literacy and a love of books. Conversely however, Rabbi Lapin suggests that people holding advanced degrees are not necessarily more likely to achieve wealth. They tend to do poorly with money, and often seek employment at universities rather than focusing on financial independence. Rabbi Lapin tackles the fallacy embraced by so many in society that business, business people, and money are somehow bad. He illustrates how “movies and television conspire to make you poor,” showing that since the 1970s, business people are portrayed as villains twice as often as any other demographic. The constant pushing of this message has effectively brainwashed the viewing public into accepting the narrative. He confronts this fallacy by explaining that most wealthy business professionals have actually made their wealth by enhancing the lives of consumers. Lapin also explains that popular culture vilifies wealth, but admires immoral behavior. He illustrates this last point by showing that many of People magazine’s “Greatest Love Stories of the Century” were in fact cases of marital infidelity. Perhaps the most valuable lesson in Thou Shall Prosper, is one that is also asserted by many other successful people: the importance of understanding that we are already in business. By virtue of being alive and independent, our lives are our businesses, whether we realize it or not. We may even have a board of directors, such as our friends or family whom we ask for advice or guidance in financial matters. Moving forward with this logic, I suppose we can count our spouses, children, or other dependants as our shareholders so to speak. By illustrating this, Rabbi Lapin further explains the importance of not being a wage slave. Wealth is created through human interaction. In order to be successful in business it is imperative that one have a large network of friends that can help encourage you on your path to prosperity. Rabbi Lapin does not suggest you should attend business oriented breakfasts and luncheons to make these acquaintances. Such gatherings, he says are too full of self interest, yours as well as the other attendants. Instead he recommends joining civic service organizations like the Rotary club. He also recommends donating heavily to charity. This sort of contribution raises your consciousness, and may contribute to a karmic increase in our own wealth. It is important to value ancient literature and history. This helps you to see patterns in time and human nature, and to gauge the future in order to set goals. This is not just a Jewish trait. Many Asian businessmen also apply lessons learned from ancient Taoist, and Buddhist literature to their financial plans and aspirations. Regularly disconnecting yourself from daily distractions like television, radio, and other external influences is imperative. This allows you to clear your head and take notice of things that you might have otherwise overlooked or ignored. These may be useful thoughts and fully formed ideas. These are all things that can help you more accurately foretell and plan for the future. Set aside a regular time and day for such activities during which you can be alone, away from distractions in order to do nothing but reflect on trends, ideas, and set goals. These are only a few examples of the remarkable lessons that can be found in this profound book, but it only scratches the surface. 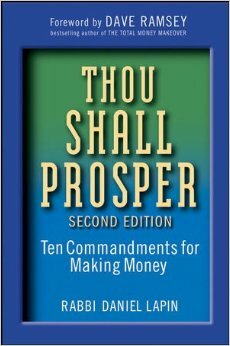 Thou Shall Prosper by Rabbi Daniel Lapin is not a typical book on business. It’s much more than that. This is a book of finance, philosophy, religion, history, sociology, and self-improvement. Much like any classic work of philosophy, and like the Torah by which much of this book is inspired, Thou Shall Prosper is not just a one time read. It’s the type of book that needs to be read, reread, thumbed through, and meditated upon multiple times over in order to get the fullest use out of it. I highly recommend this book for anyone wanting to improve their life financially and spiritually. * It is unfortunate that I or Rabbi Lapin would even feel a need to mention this, but due to the nature of the real world (and anyone who has spent any time on the internet will know), it must be addressed.